Nine educational organisations across Europe have joined their experience against hate to develop tolerance and prevent violent radicalisations. We want to share ideas, strategies and tools for teachers, trainers and educators. Guidelines provide a framework for action at three levels of intervention: teachers' training, the school and the classroom. They design strategies and set theoretical milestones to optimise the use of the Tolerance toolbox. Teachers, trainers and educators will find resources to increase their understanding of processes leading to violent radicalisations, case studies based on real life experience to consider alternative solutions and activities to implement with learners. Here is the 4th newsletter. This release contains information about the experimentation of the toolbox. The third newsletter is available as an introduction to the Tolerance Guidelines. The Portuguese team from U.Porto has analysed the needs analysis reports from eight partner countries (Austria, Cyprus, France, Italy, Portugal, Romania, Slovenia, Spain) in order to produce a global document systematising all needs. The summary is available in the document "Identification of Educational Needs to Prevent Radicalisation". From this, strategies have been identified and organised into three levels of intervention in relation to a theoretical framework. The first level is the “Teachers’ Training” level, where we indicated possible actions and orientations that can provide knowledge and skills to teachers. 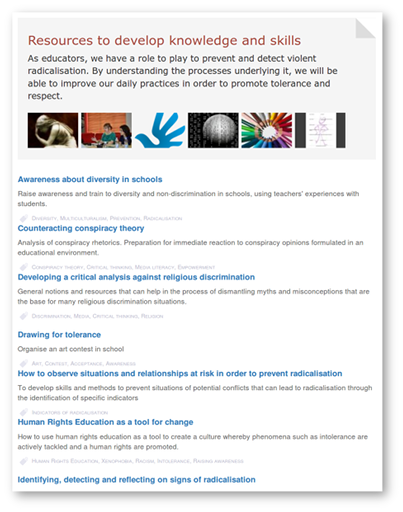 The “School” is the second level of intervention, with possible ways to work on discrimination problems and to prevent radicalisation, under a collaborative action among all members of the school context. Lastly, the “Classroom” level is related to the importance of teachers/trainers discussing these topics with their students. Strategies are summarised in the document "Theoretical Options and Strategies to Prevent Radicalisation"
These strategies have the goal of supporting vocational teachers/trainers who intervene with students/trainees in a situation of socio-economic vulnerability and who might face the risk of radicalisation. The second newsletter is available. 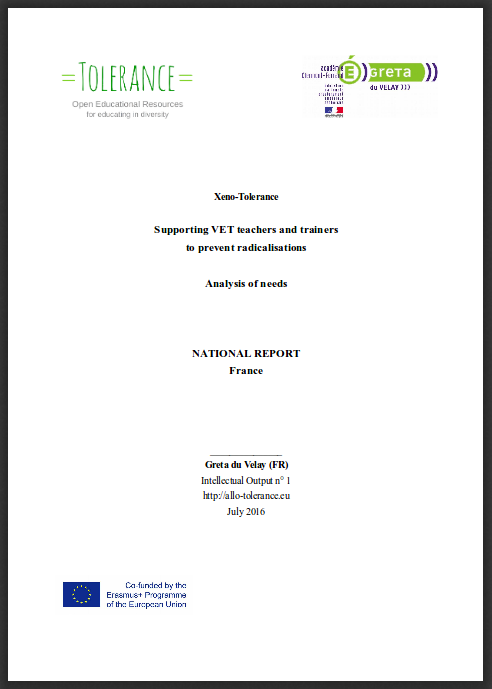 It presents the results of the needs analyses that were carried out in each partner country, together with examples of continuous training offered to teachers, trainers and educators. You can download the newsletter in all the languages of the partnership. For open educational resources, we will rely on the definition provided by UNESCO: "teaching, learning and research materials in any medium, digital or otherwise, that reside in the public domain or have been released under an open license that permits no-cost access, use, adaptation and redistribution by others with no or limited restrictions." In the state-of-the-art analysis, we try to locate open resources serving the purposes of the Tolerance project. We will use them and disseminate these resources. But our purpose is also to produce our own ressources to fill in the gaps that were detected. All of these materials will be disseminated through this website in nine languages. Each partner is engaged in a state of the art needs analysis in their respective countries. We do not limit our research to our own organisations, addressing and questioning local and regional environments, other educational organisations and relevant stakeholders. For each of the partner countries, the needs analysis includes a literature survey, an online survey, face-to-face interviews with educators and thematic experts as well as a focus group. National reports will allow the project to respond to the needs of each partner, while their common analysis will constitute the basis for elaborating a common framework of action and preparing the Tolerance open resource centre. The first newsletter is available. It explains the context, the objectives and the expected results of our project. You can download it all the languages of the partnership. 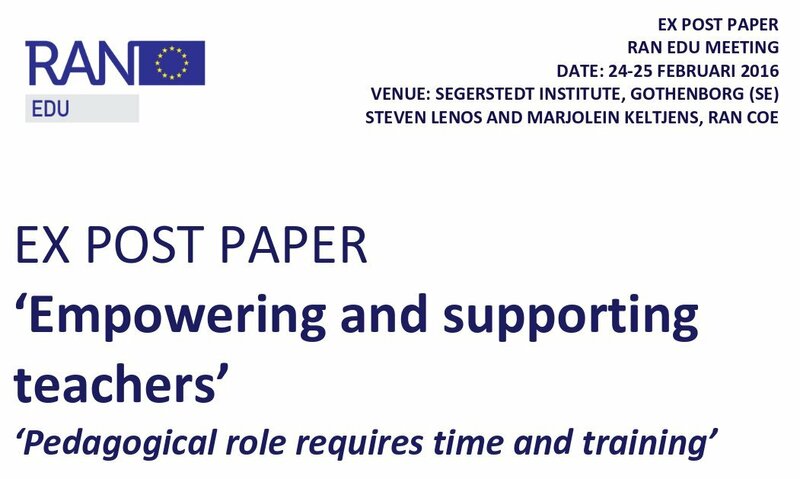 The European Radicalisation Awareness Network has created a working group dedicated to education that has published a paper about "the empowerment of teachers so that they are confident and well equipped pedagogues". Still, the main conclusion is that teachers who are fully mastering the core of their job are the more prepared to react against radicalisation. If they are empowered, they will be able to "create a safe space for students to find their place", to face new challenges, manage difficult exchanges and deal with critical situations. The meeting has been organised with the generous support of PRAO on their premises. Partners delivered a collective overview of the project objectives and deadlines. They prepared a needs analysis for each individual country. 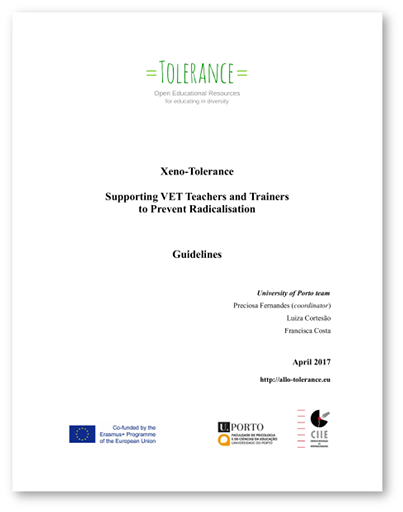 Here you will find concrete examples of how the Toolbox can be used to prevent radicalisation in educational contexts. Tolerance is considered in the moral sense, following André Compte-Sponville in Petit traité des grandes vertus (Paris, 1995). It is the virtue that brings us to respect what we do not spontaneously agree with, for example when it is contrary to our own convictions. It is also the virtue that leads us to be vigilant against intolerance and against the intolerable.